Metallic asteroids are thought to have started out as blobs of molten iron floating in space. As if that's not strange enough, scientists now think that as the metal cooled and solidified, volcanoes spewing liquid iron could have erupted through a solid iron crust onto the surface of the asteroid. This scenario emerged from an analysis by planetary scientists at UC Santa Cruz whose investigation was prompted in part by NASA's plans to launch a probe to Psyche, the largest metallic asteroid in the solar system. 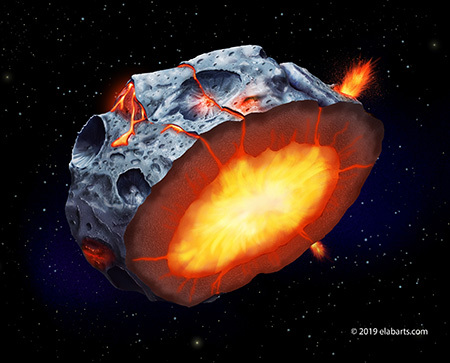 Francis Nimmo, professor of Earth and planetary sciences, said he was interested in the composition of metallic asteroids indicated by analyses of iron meteorites, so he had graduate student Jacob Abrahams work on some simple models of how the asteroids cooled and solidified. "One day he turned to me and said, 'I think these things are going to erupt,'" Nimmo said. "I'd never thought about it before, but it makes sense because you have a buoyant liquid beneath a dense crust, so the liquid wants to come up to the top." The researchers described their findings in a paper that has been accepted for publication in Geophysical Research Letters and is available online. Metallic asteroids originated early in the history of the solar system when planets were beginning to form. A protoplanet or "planetesimal" involved in a catastrophic collision could be stripped of its rocky outer layers, exposing a molten, iron-rich core. In the cold of space, this blob of liquid metal would quickly begin to cool and solidify. "In some cases it would crystallize from the center out and wouldn't have volcanism, but some would crystallize from the top down, so you'd get a solid sheet of metal on the surface with liquid metal underneath," Nimmo said. As for what the iron volcanoes would look like, Abrahams said it depends on the composition of the melt. "If it's mostly pure iron, then you would have eruptions of low-viscosity surface flows spreading out in thin sheets, so nothing like the thick, viscous lava flows you see on Hawaii," he said. "At the other extreme, if there are light elements mixed in and gases that expand rapidly, you could have explosive volcanism that might leave pits in the surface." NASA's Psyche mission is scheduled to launch in 2022 and reach the asteroid in 2026. Signs of past volcanism that researchers could look for include variations in the color or composition of material on the surface, and possibly features that look like volcanic vents. Large volcanic cones are probably unlikely, Abrahams said. Unfortunately, because metallic asteroids would have solidified fairly quickly after their formation, there has been plenty of time (billions of years) for any surface features of volcanism to be degraded. "It's not clear what they might look like now," Abrahams said. The best opportunity to find evidence of ferrovolcanism on metallic asteroids might actually come from studying iron meteorites already in collections on Earth, the researchers said. "There are lots of these metallic meteorites, and now that we know what we're looking for, we might find evidence of volcanism in them," Nimmo said. "If material got erupted onto the surface, it would cool very fast, which would be reflected in the composition of the meteorite. And it might have holes in it left by escaping gas." When they presented their findings at a recent Lunar and Planetary Science Conference, Abrahams and Nimmo discovered that another research team had independently arrived at similar conclusions about the possibility of ferrovolcanism. "It's not a shocking idea, but we'd just never thought about iron volcanism before, so it's something new and interesting to investigate," Abrahams said. This research was supported in part by NASA.